"Easy gluten-free dinner for the family." Preheat oven to 400 degrees F (200 degrees C). Line a baking sheet with parchment paper. Place squash, cut sides down, on baking sheet. Bake squash in the preheated oven until it starts to soften, about 25 minutes. Reduce oven temperature to 350 degrees F (175 degrees C) and continue baking until easily pierced with a knife, about 25 minutes more. Remove from the oven and cool until easily handled. Cook sausage in a large skillet over medium heat until browned, about 5 minutes; remove from skillet. Add onion, celery, and carrot to the skillet; cook and stir in sausage drippings until starting to soften, about 5 minutes. Stir cooked sausage, diced tomatoes, chicken broth, tomato paste, and garlic into the skillet. Simmer sauce until flavors combine, about 15 minutes. Use a fork to scrape insides of squash into spaghetti strands. Transfer strands to a 9x13-inch casserole dish. Spoon sauce over strands and stir to combine. Cover with mozzarella cheese. Bake in the preheated oven oven until bubbly and golden brown, about 25 minutes. 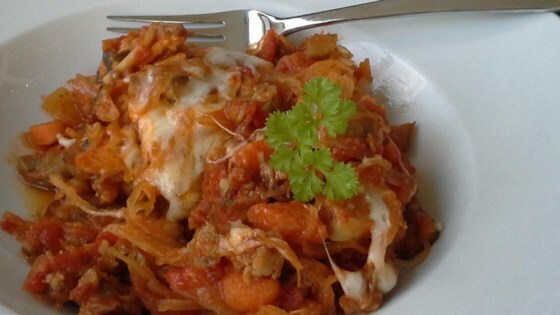 Quick & easy spaghetti squash dish! Great recipe! This can be made vegan as well. Just substitute vegan cheese, Tofurkey Italian sausage, and vegetable broth. I’ve made it 3 times now and I love it. Really good and I used hot turkey Italian sausage. turned out great! I doubled the recipe and made two dinners. the family LOVED it. even my son who never eats vegetables!